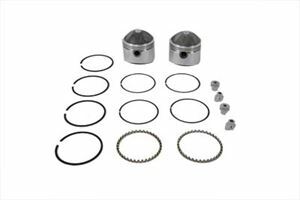 S&S 3-3/16" bore piston set .030 oversize includes rings, wrist pins and retainers. Set has a 9:1 compression ratio. **Note:Run engine at moderate speeds for at least 500 miles, avoiding excessive running in lower gears, in order to properly break-in new pistons and rings.